The Rajdoot GTS 175 was quite a popular bike during its time. Often refereed to as the monkey bike due to its hunched seating position and low powered engine, it was made more popular by Bollywood actor Rishi Kapoor when he used the motorcycle in the famous flick ‘Bobby’. It is from here that this bike got its Bobby nickname, which has stuck with its till now. Not many perfect examples of this 70s bike remain now. 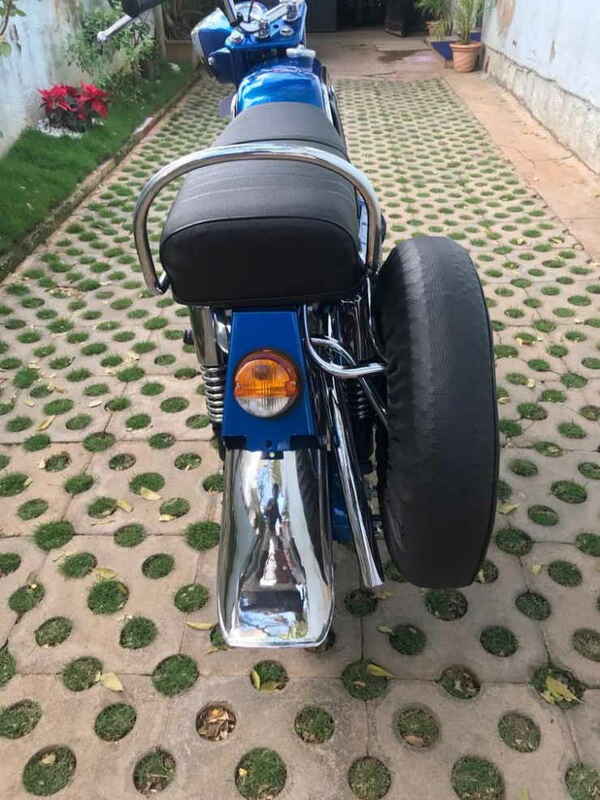 However, R Deena Dayalan, an avid motorcycle collector and restoration expert from Mysore has restored an old GTS 175 to its original glory and the bike looks as fresh as a daisy. Looking at the bike one can’t say that it was in quite a bad condition some time back. According to the owner of the motorcycle, the Bobby is hard to get and he got the one through one of his Facebook friends after he saw some pictures of the motorcycle. At the time when he bought the pocket bike, it was in a bad shape but not beyond repair. The bike cost him a sum of about Rs. 45,000, after which he had to spend another Rs. 35,000 to bring the beauty back to its original essence. On how the spare parts were sourced, the owner says that he got several parts of the Rajdoot GTS 175 from Delhi. A total of three months were spent on the bike in order to make it a gleaming beauty again. Coming to the motorcycle, the Rajdoot GTS 175 seen above retains the stock parts and the original styling as on the original classic. Design elements like chrome panels on the front and rear fender, on the headlight mask, engine covers and on the sides of the fuel tank resemble the original GTS 175. The matching shiny blue paint job further adds up to the overall look of the motorcycle. Attention to detail is also on an excellent level, which can be seen in the way shock absorbers have been bathed in chrome and the body coloured exhaust pipe heat shield on the right-hand side of the GTS 175, accompanied by a spare wheel. The spare wheel is covered with a cover to not make it a sore point on the bike. 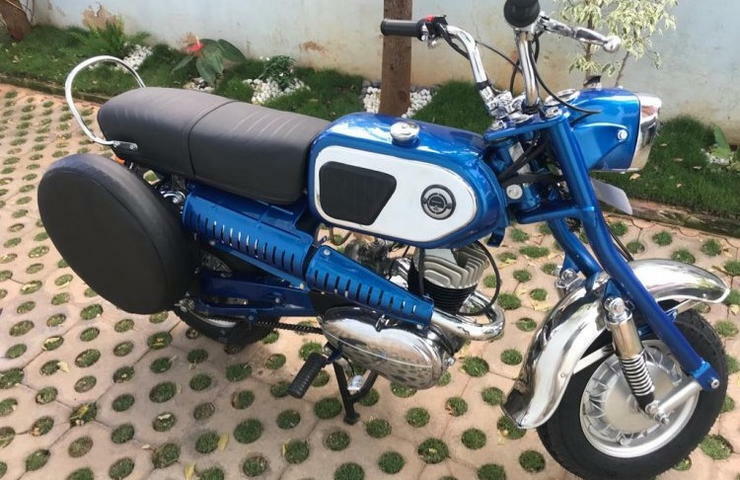 Moving on, the Rajdoot GTS 175 gets powered by a 173cc, single-cylinder, air-cooled, two-stroke engine that churns out 7.5 Bhp of power along with 12.7 Nm of torque. 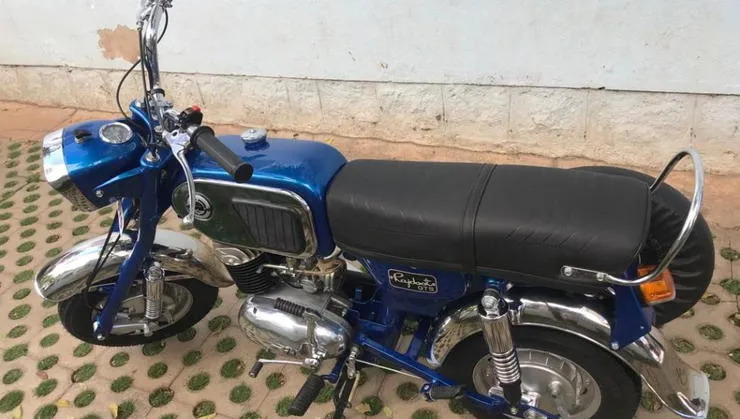 The same engine was also found on full-size Rajdoot motorcycles. However, the GTS 175 weighs a mere 93 kg, which translates into it having a much better high power-to-weight ratio. Braking duties are done by drum brakes present on on both wheels. Spring type shock absorbers do the suspension duties. The motorcycle was India’s first mini-bikes, a precursor to the Honda NAVi that’s currently available in the Indian market. Kudos to the hard work and dedication of the owner who has restored the bike to immaculate condition.